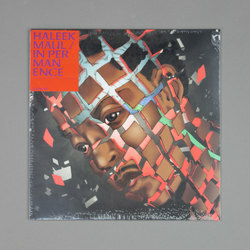 Haleek Maul - In Permanence EP. Vinyl 12. Bleep. After a few years off in order to finish his studies, precocious young rapper Haleek Maul has signed to Lex (Mike, Doomstarks) and dropped a new EP. Maul claims influences as diverse as Vybz Kartel, Damon Albarn and Crystal Castles, and his omnivorous approach to pop serves him well on the In Permanence EP. Across these seven tracks Maul proves capable of shifting between flows and genres with ease - one minute he’ll be drowning in a Yeezus-style beat soup, the next we find him cooing sweet nothings in a manner reminiscent of Frank Ocean. On some tunes - ‘Blessai’, ‘Moodring’ - these switch-ups occur verse by verse. Embaci and Saul Williams guest.